As the third quarter comes to a close, and with year-end looming just beyond the holiday season, there are several changes and updates to be aware of regarding the not-so-distant preparation of the 2018 Annual Statement. With this writing we begin a short series that will highlight the changes in more detail to ensure our customers have another quality resource to leverage and allow for better understanding of what’s to come. To begin, and for consistency with the Gain Compliance story, we first look to highlight the actions taken by the NAIC that will impact the filing of the 2018 Notes to the Financial Statements. And, as Gain Compliance continues to evolve into a full statement solution for our customers, our next posts will provide an overview of impacts to other schedules. INT 18-03: Additional Elements Under the Tax Cuts and Jobs Act – INT 18-03 was discussed in our previous blog post on the impact of the tax law changes. Please refer to our update from the 2018 NAIC Fall Meeting for more information in regards to reporting requirements for the 2018 Annual filing. 2018-08BWG – This modification will add a new data-captured table to Note 3A. The disclosure will now report the admitted amount of goodwill as of the reporting date, which was formerly reported in 3A(3) and 3A(4) of the disclosure. 2018-09BWG – The instructions for Note 20A, 20C, and 20D will be modified to reflect changes to SSAP No. 100R – Fair Value adopted by the SAPWG. The adoption necessitates modifications to the illustrations for Note 20A and Note 20C to move and data capture the NAV column. It also led to the addition of a new disclosure, 20E, which outlines the minimum disclosures required for instances in which an investment may be sold below NAV, as well as significant restrictions in the liquidation of assets held at NAV. 2018-12BWG – Due to changes to SSAP No. 86 – Derivatives adopted by the SAPWG, an illustration was added for Note 8H to be data-captured. Beyond the Notes, Schedule DB was revised to add electronic-only columns, a new code, and enhanced instructions to include a new definition of “Finance Premiums”. 2018-15BWG – This update adds a new data-captured disclosure, Note 10.O, SCA Loss Tracking, to Note 10 to reflect changes to SSAP No. 97 – Investments in Affiliated, Controlled and Affiliated Entities (“SCAs”) adopted by the SAPWG. The modification clarifies the accounting and reporting for SCAs in a deficit position, which will be required until the SCA is in a surplus position for an entire year. 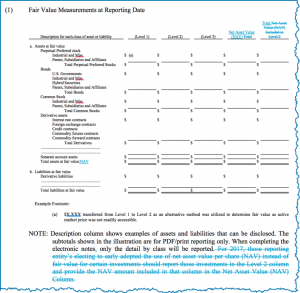 2018-16BWG – Disclosure 12C(2), Fair value measurement in Level 3 of the fair value hierarchy, will be removed and 12C(3), Valuation techniques and inputs to measure fair value, will be renumbered as 12C(2) in order to reflect changes to SSAP No. 92 – Postretirement Benefits Other Than Pensions and SSAP No. 102 – Pensions adopted by SAPWG. 2018-17BWG – The instructions for Note 17C were modified to exclude all cash equivalents, derivative instruments as well as short-term investments with credit assessments equivalent to an NAIC 1 or NAIC designation from the Wash Sale disclosure.